Reference number for this case: 23-Aug-54-Brignoles. Thank you for including this reference number in any correspondence with me regarding this case. Monday morning around 05:45, our fellow-citizen Jean Vial returned by car from his domain of La Lieue, when arrived at the top of the small hill of La Rouge, he saw at some five hundred meters in front of him, flying at a 300 meters height approximately, a rather large object of oval form, of a sharply orange and bright color, moving from the South towards the North. By the time he stopped the car and came out, the object, which did not emit any sound, disappeared behind the hills. At the time when this phenomenon occurred, a violent mistral [wind usually from the North] blew and if it were a weather balloon, it would have being pushed towards the East. Mr. Vial made a statement at the gendarmerie. Not looked for yet. The Moon? 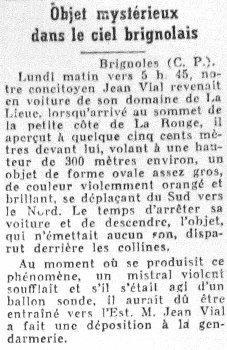 [lp1] Article in the regional newspaper Le Provençal, France, page 4, August 29, 1954. This page was last updated on January 27, 2009.